I’ve been on my own this week. When that happens, I don’t cook a great deal, mainly because the routine disappears. When the routine goes, so does my will to cook anything much at all. I get too easily distracted by Other Projects that eat up the evenings, other things that need doing. Time slips away until all I can be bothered cooking is an omelette or heating up something that’s been sat in the fridge for a day or two. Most of the time, I quite enjoy that because it’s easy. It’s simple. sits on my shelves…it’s a fascinating book, beautifully presented and packed with wit and knowledge. It has passion and enthusiasm, verve and excitement. But do I cook from it? Too complicated. I can do without thrice cooking chips using a grand’s worth of sous vide machine. That type of cooking has never appealed to me, with its crazy playfulness and over-worked procedures. The problem is the complicatedness of it all, the fiddliness, the self-conscious artifice. The key to this recipe is a good pork chop. Find one with a nice, thick layer of fat, and cut into the rind and fat every centimetre or so to stop the chop curling up in the pan. These cuts also let the marinade get to more surface area, which makes for better tasting fat. I prefer simplicity in food. I prefer recipes that are stripped down, lean, where everything counts, where everything has a purpose and a reason. What does a very good piece of steak need with it? Some mustard, salad? Some chips? Is that plate of food more satisfying, more rustically enjoyable than the same steak faffed around with and dressed up in a reduction of something or other with a vast array of complicated sides? It depends on the circumstances, and if there are any Michelin starred chefs out there who want to go to the trouble of rustling up something over-complicated for me, be my guest, but at home, in my kitchen, I’m going to go for the simplicity of a nearly naked steak every time. suggests that because simplicity appears easy, we believe that it’s easy to do, and become disheartened when we fail, so we stop trying. Simplification is complicated and difficult, but the end results are better, leaner, more rational. That may sound paradoxical, but the journey to simplicity is the real test, the real challenge. The chop needs to be marinated overnight. It’s a simple process…just mix together three tablespoons of dark soy sauce, four tablespoons of grain mustard, the zest and juice of both a lemon and an orange, half a teaspoon of dried thyme, a couple of cloves of crushed garlic and 100ml of maple syrup. Season with salt and pepper and pour over four pork chops, turning and basting so that everything is covered in everything else. How could that not taste good? How many things do you cook the way you do because that’s the way you’ve always done it, that’s the way you were shown how to do it? Do you ever wonder whether that’s the best way of doing that thing, whether there might be a better way of peeling a whole head of garlic, or shelling an egg, of doing any of the thousands and thousands of jobs and processes that support a working kitchen? You probably don’t because to do so is hard. It’s easier to carry on the same way as always. Stepping back from something and looking at it with new eyes is challenging and, in most cases, we find ourselves blinded by our own experiences. We can’t see past what we already do. A few years ago, we had a new kitchen installed. The old one, the one that was falling apart was arranged in a very traditional way, with units around the edge of the room, overhead cupboards, sink under the window. Very pedestrian and very predictable. We thought hard about what we wanted our new kitchen to look like, but subconsciously, our designs and idea followed the groove that had already been cut. Where else could a sink go, after all, if not under a window? Sinks go under windows, so that you can look at the garden when you wash up. We just forget about that dishwasher over there, the one that means that we weren’t actually going to stand at the sink for any length of time at all, and therefore really didn’t need the view. 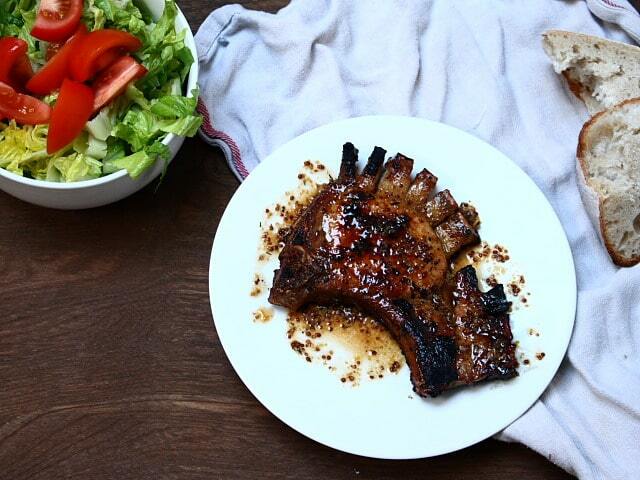 Cook the chops in a hot grill pan, eight to ten minutes on each side, basting regularly with more of the marinade. Pour the rest of the marinade into a small pan and bring it to the boil, simmering for a few minutes until you’ve got an impromptu but zesty sauce. Enter a professional kitchen designer, somebody who builds kitchens for a living and understands the ergonomics of space and the way we’d actually use it. He turned our thoughts inside out, moving everything away from the walls and centring it around a long island with a sink embedded in the middle, a fridge and dishwasher hiding underneath a massive piece of granite. In practice, it works perfectly, but we would never have arrived at that design, never seen the inherent simplicity of it, how it eases the way we cook. Stepping back and looking with new eyes is difficult. There are lots of parallels in the world of food. Is cooking just too complicated? Do recipes demand too much, to the point where people just don’t bother, or have we just lost skills that we once took for granted, skills that mean that basic cookery tasks aren’t complicated in the first place? It’s a combination of many things…there’s a perception that cooking is hard, or that it takes too long, which steers people towards the ready meal or the over-processed. The irony of this is that, while slamming a ready meal in the microwave is easy, cooking a meal of a vastly superior standard from scratch is hardly difficult, if you’re equipped with the right ingredients and the right ideas, and a bit of confidence on the side. Cooking should be simple. Everybody can do it. Some people may say that’s a bold claim, but I’ll stand by it – everybody can cook something truly excellent, and the reason for this is because culinary excellence is also very often a product of simplicity. Leave Heston to the fancy stuff. I love the combination of Salt and Sweet in this marinade.. It is funny how difficult simplicity can be.. I totally agree with you here. I too have a few of Heston’s books and, don’t get me wrong – I love the man – he must be a wizard – but it isn’t practical cookery and at the end of the day does it taste any better than something similar without the novelty cooking? I also have the Ginger Pig Meat Book and I’ve cooked from it many times. Recipes like this one try and bring out the best in the meat without bells and whistles and dry ice. Thanks for sharing the recipe and your thoughts! Love the marinade! I will have to try it. I agree with you about simple food prep. I don’t want to spend all day in the kitchen but I like to cook flavorful food everyday. I have found simple things can be so delicious and fussy, overly complicated recipes can be frustrating and time consuming without being worth the time and energy. To be fair to Heston, I’ve got Heston at Home and his chocolate biscuit recipe is simple and delicious — and very adaptable. But in general, I wholeheartedly agree with your post!